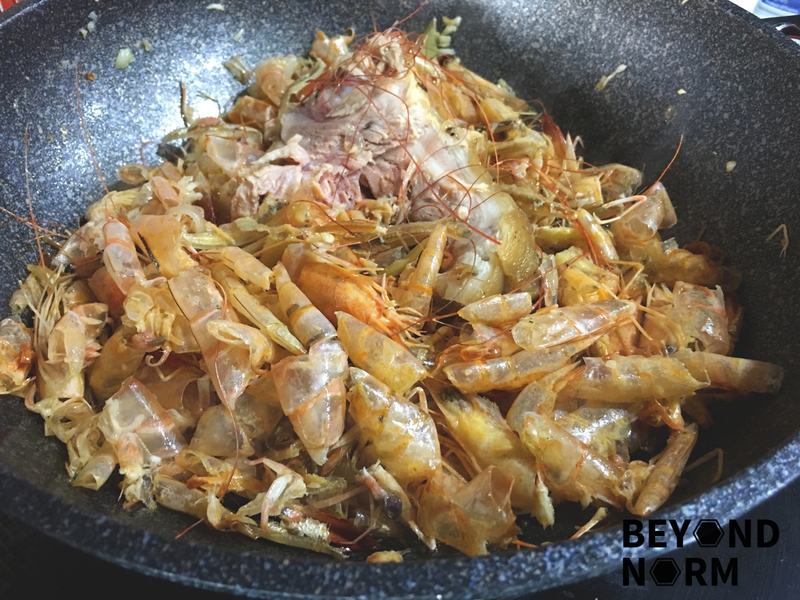 When I first introduced Singapore Hokkien Prawn Mee to my family, they were expecting a bowl of soupy prawn mee but were shocked to see a plate of fried prawn mee served in opeh leaf. I must say this is truly a unique Singapore dish which I am proud of. 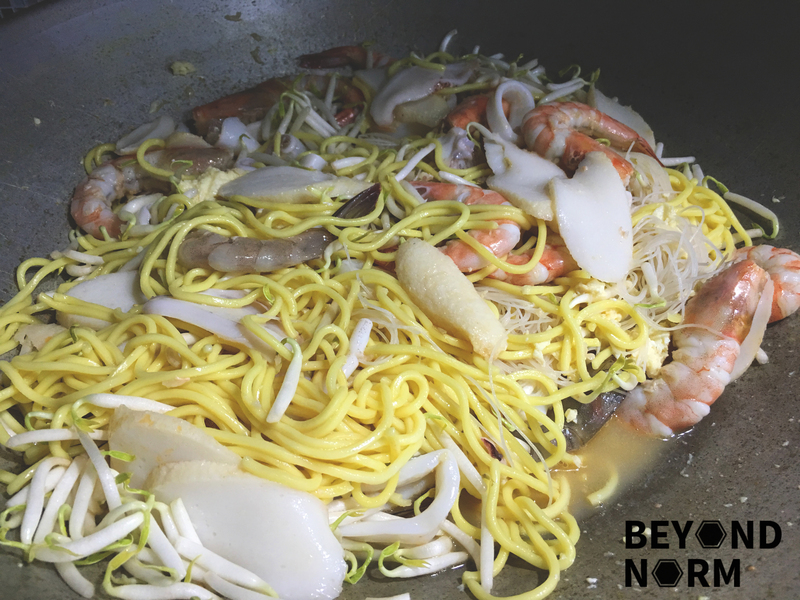 To cook this dish, the key is to flood the noodles with a good broth and the end result is the noodles must be flavourful and looks kind of damp. Lastly sambal chilli and lime are the standard toppings for this dish, giving it that extra zing and tanginess. The best part is the wok hei!! (Wok hei is a Cantonese term which means ‘wok thermal radiation’ or literally means the ‘breath of the wok’. It refers mainly to the flavour and tastes imparted by a hot wok on food during stir frying. 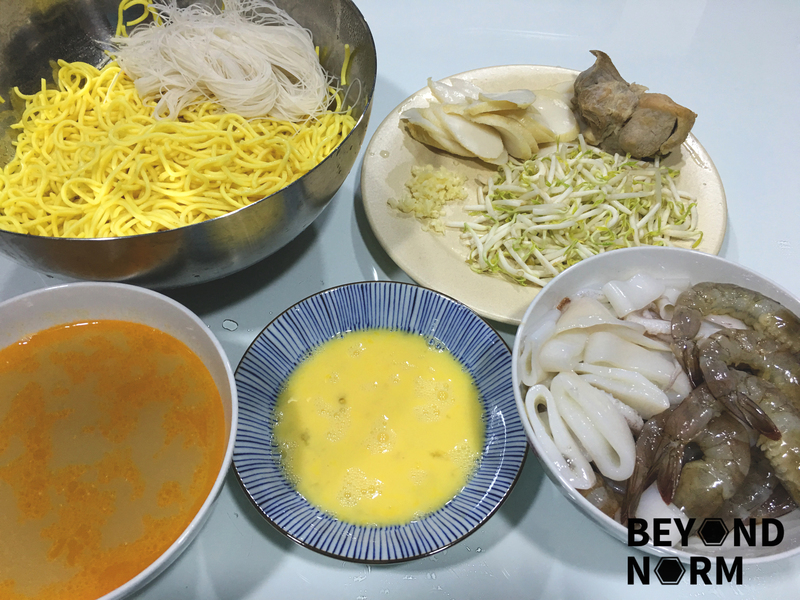 150g rice vermicelli (bee hoon) – Usually thick bee hoon is used but I used the thin bee hoon. Peel the shell of the prawns and leave the tails. 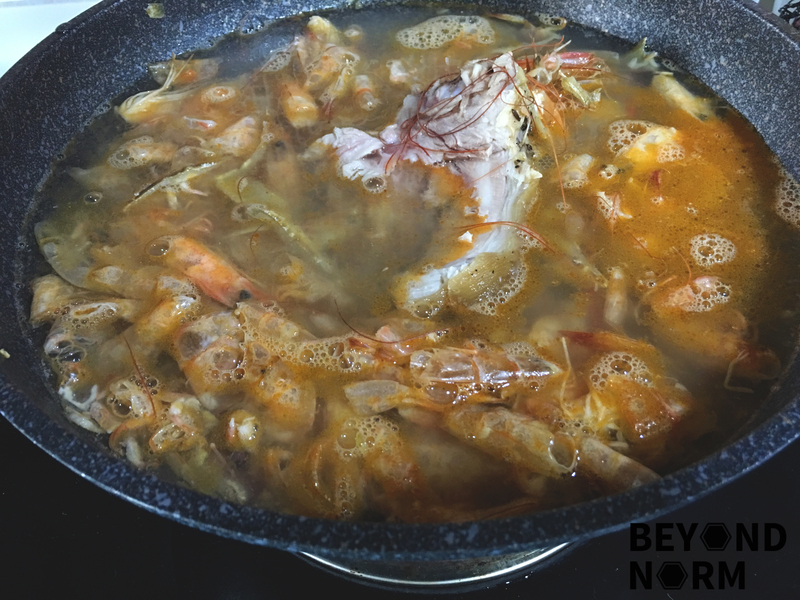 Rinse and set aside the shelled prawns and the prawn shells and heads. Rinse the ikan billis and set aside. Rub 1 tablespoon of salt on the pork bones and set aside for 5 minutes. After 5 minutes, rinse off the salt and set aside. Heat up the pan and add 3 tablespoons of oil. Add the garlic, shallot and ginger and stir fry till fragrant. 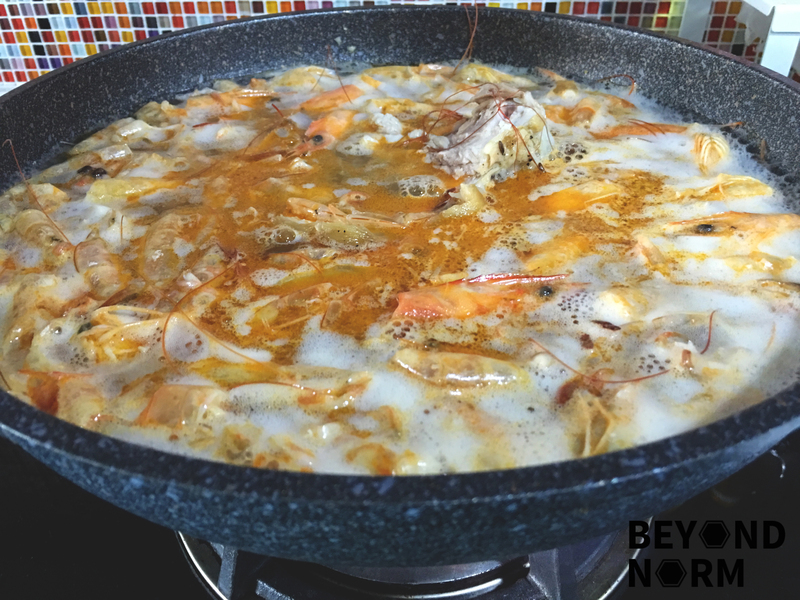 Add in the prawn shells and heads and the ikan billis and stir well. Add in the pork bones, water and the seasoning. Bring to boil then lower the heat. Simmer for 45 minutes. Remove all the ingredients from the broth by using a sieve. Rub a tablespoon of salt on the 200g of pork and set aside for 5 minutes. After 5 minutes, rinse off the salt from the pork. Bring the broth to a boil and lower the heat. Poach the pork in the broth. Once the pork is done, remove it from the broth and turn off the heat. Slice the pork thinly and set aside. 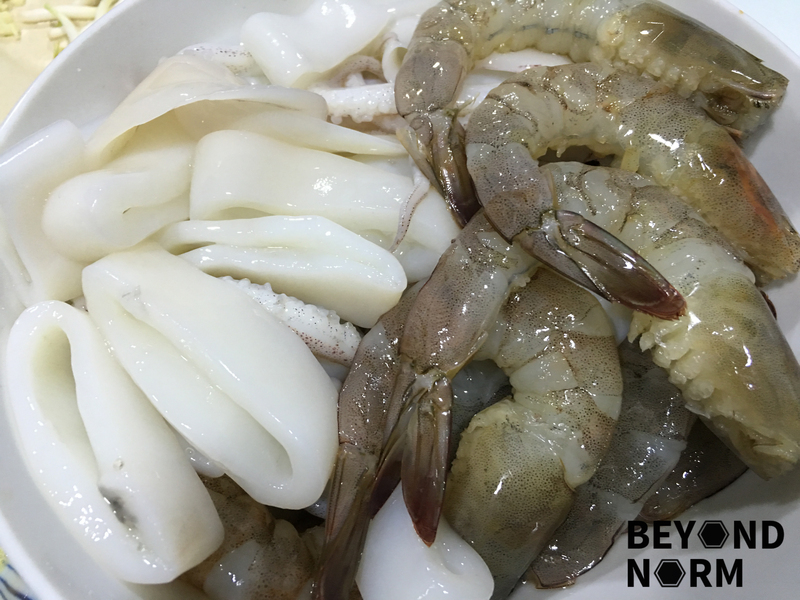 Clean the squid and slice into rings then set aside. Slice the fish cakes and set aside. Wash and cut the chives into 4 cm in length and set aside. 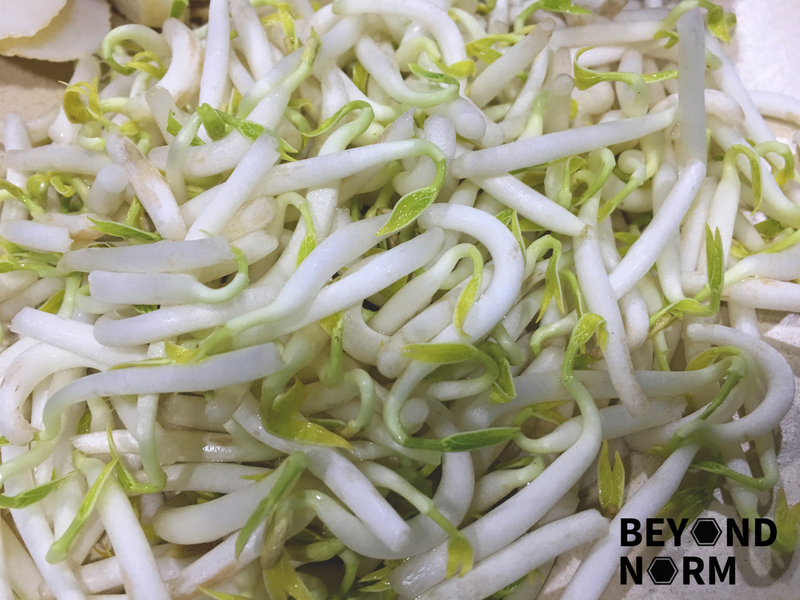 Nip off the tail of the beansprouts and rinse and set aside. Soak the bee hoon in water as per instruction on the package. Once it is soft, drain off the water and set aside. Rinse the yellow noodles under a running tap. Blanch the noodles in hot water quickly. This is to eliminate as much alkaline taste from the yellow noodles as possible. 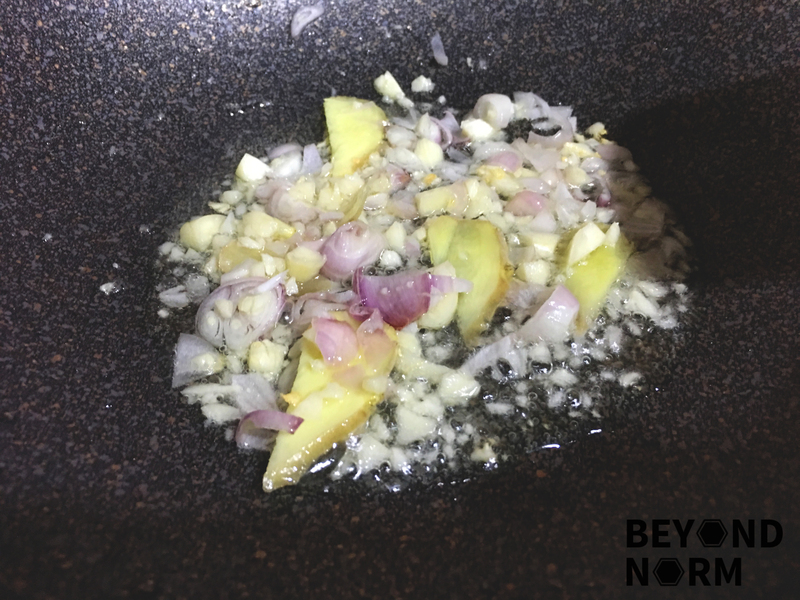 Heat up a wok/pan and add 1 tablespoon of oil. Add the chopped garlic and stir fry till is fragrant. 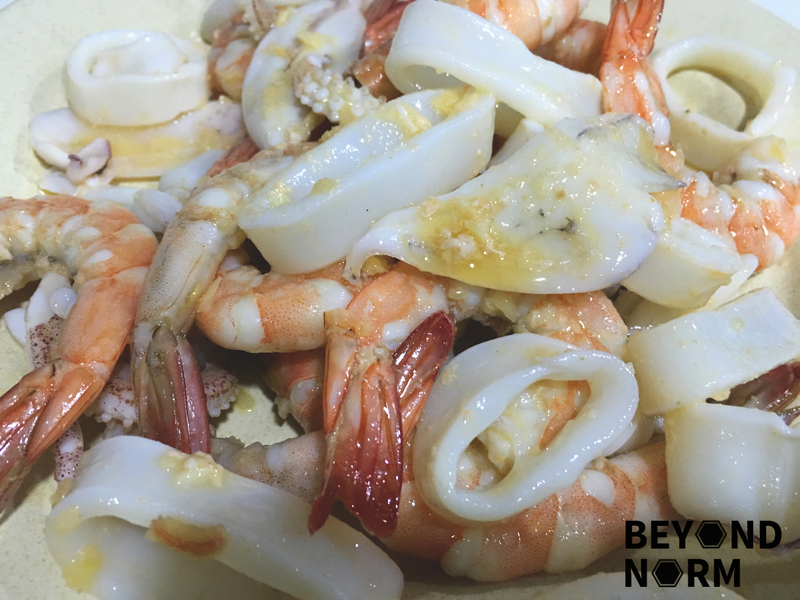 Next add in the prawns and squid and give them a quick stir fry about half a minute and dish out and set aside. Add 2 tablespoons of oil and then in goes the beaten eggs. 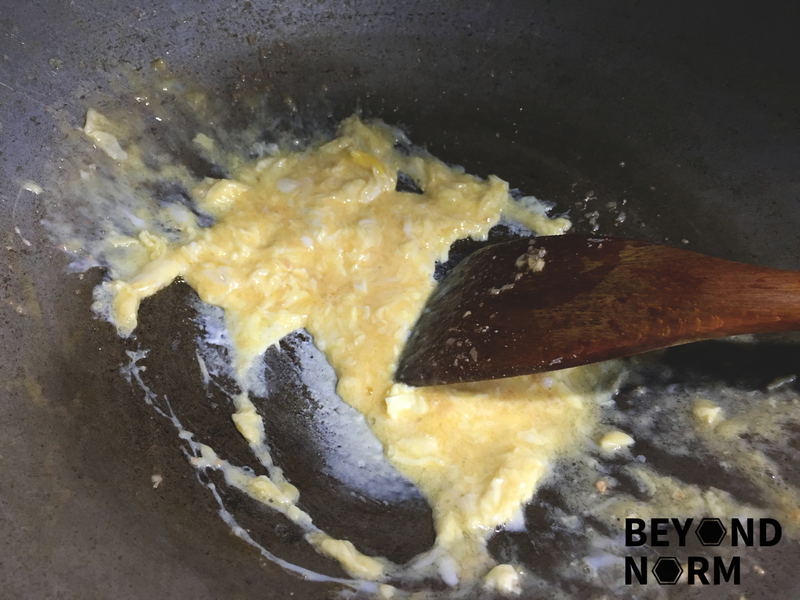 Scramble the egg quickly with a spatula until it is semi set. Add in the yellow noodles, rice vermicelli and 2 ladles of the broth. Stir fry on high heat for 1 minute. Add in the squid, the prawns, the chives, beansprouts, fish cakes and pork. Mix everything together. Add 2 more ladles of broth and cover with lid to simmer for 2 to 3 minutes. 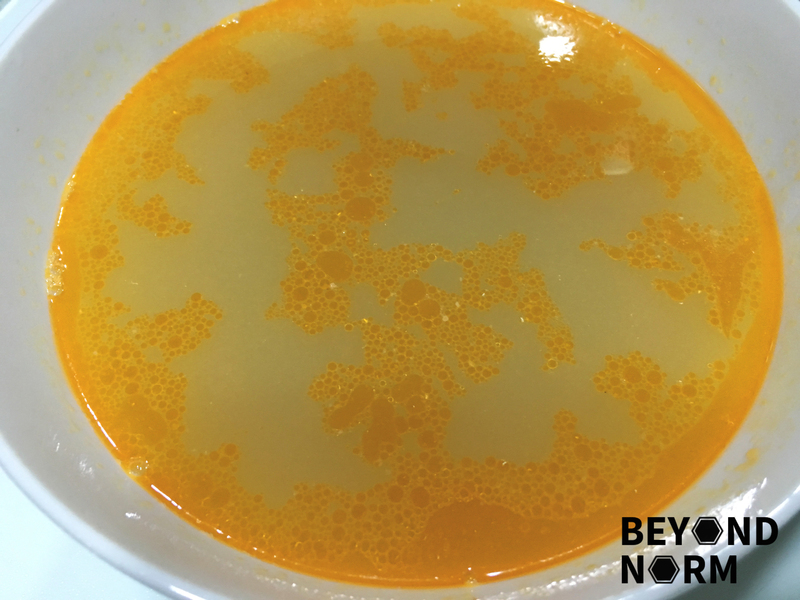 Turn off the heat and if it is too dry, add additional broth. Dish out the noodles and serve with some sambal and cut lime at the side.